Yesterday's workout was a favorite from the carb cycling program I did (and still do on my own) a couple of years ago. I had such good results from the program that I still follow the cycle and do the workouts. Doing this helps me maintain and stay at a healthy weight. Low carb days were always my favorite because I really do love cardio. The great thing about these workouts is that they are short. Intense, but short. 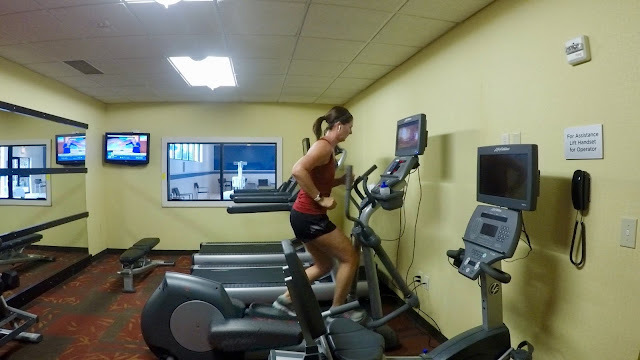 There are also options: I can swim, run, elliptical or HIIT and get the same effect from the cardio bursts. 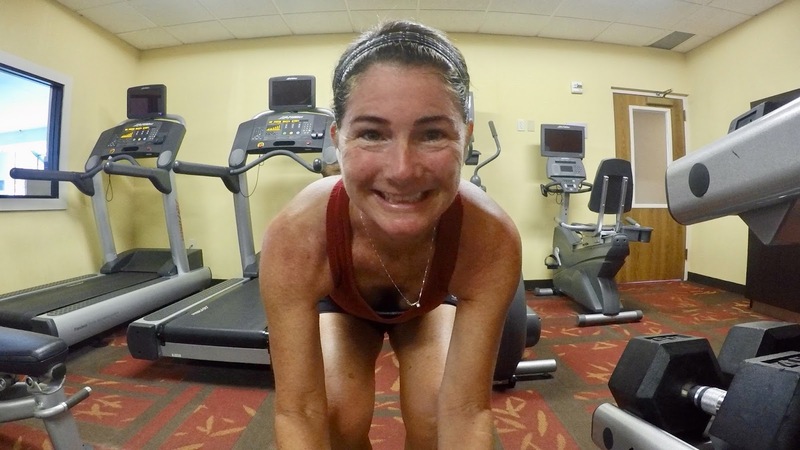 So yesterday, I choose an elliptical sprint workout followed by some light strength training. 1. Elliptical workout: 10 minutes warm up, 12 minutes sprints @20 seconds work, 40 seconds rest, and 10 minutes cool down. On Sunday, I complained on Instagram about how warm the fitness room was. Yesterday, it was cooler (because no one changed the setting I left it on, yay! 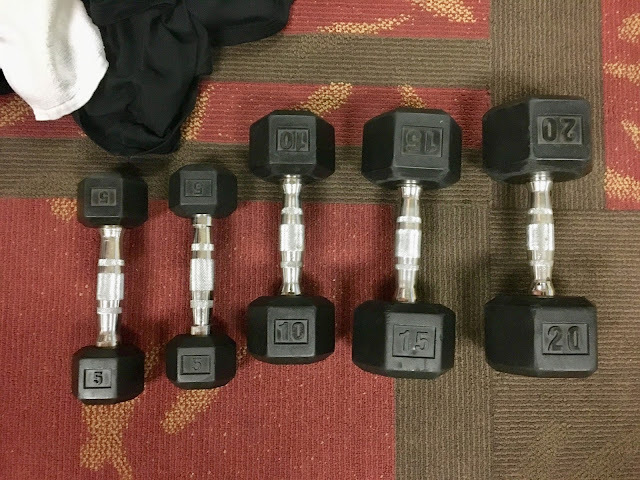 ), but I had to attach the cords to the elliptical for the tv to work and someone apparently thinks it is ok to "borrow" weights and left only one 10, 15, and 20 pounds behind. I had to get creative, but it didn't stop my workout. I would love to run the sprints part of this workout every time I do it, but I just know that it's not the best thing for my knee. After taking quite a big break from running, my knee has been feeling almost normal ---> meaning not swollen or puffy, and not achey...at all. On that note, let's look back at April. My break from running and hard hiking that started in March just sort of carried over into April. I logged three runs while traveling in the US and these were all my runs for month. The month was filled with lots of low impact exercise like swimming and walking and yoga. I think it was a good fit for what my body needed, but I dropped the ball on strength training. I need to make weights a priority again - at least a couple times a week. We traveled A LOT. Hawaii for a week to start the month (a blast) and we've been in the US for the last two weeks of the month (for mrC's work and some family time) ---> count the states: Connecticut, Massachusetts, New Hampshire, Delaware. 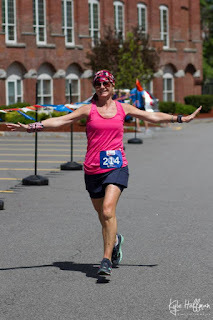 Today I'm doing the link-up with Patty, Erika, and Marcia for Tuesdays on the Run and this week we're sharing our best and worst race photos. My worst: this was my first race ever. I didn't know much about running yet, including how to dress. I'm pretty sure I'm wearing a cotton tee! My best: by 2014 I mastered the finish line photo - themed races help with that. My favorite (bonus): any race photo with mrC is my fave, but we loved this one so much we had it framed. Do you break your workouts into parts? Ever have to deal with missing weights/equipment? I guy at the gym last weekend monopolized not one but 2 different weight benches, complete with weights. Somebody finally called him out on it. Ridiculous. The other thing that makes me nuts is they have to post a sign that weights aren't allowed in the pool. Apparently people drag them in there. That's a cool pic! Ugh. People can be so clueless sometimes. I have never heard of people taking weights into the pool. Crazy! mrC and I were always flip flopping. Sometimes I needed him to get me through and sometimes he needed me. Aren't we lucky to have lifetime running buddies??? Oh, gyms are notorious for missing weights! Hoarders! I don't have that problem at home. 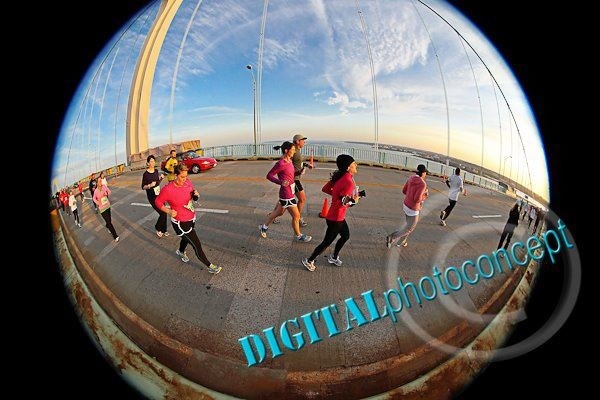 You have some great race photos! People are not cool. And seriously, who does that??? 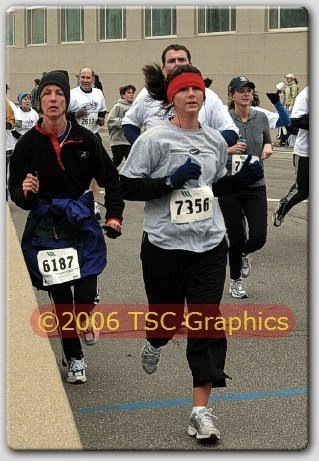 It's so funny to look back at older race pictures and remember what we "didn't know". In my first race picture I was wearing my bib way too high! Oh, I still have issues with my bib placement, haha! It sounds like you had a great month even though you were traveling alot! Those are great race pics. I love the one in the cotton tee- its such a common thing for new runners to wear! I ran with my friend who was already a marathoner and I bet she was completely amused. She was nice enough not to say anything! Hotels gyms are never stocked with the right gear and often have missing stuff. You sure did have a ton of travel lately. I also like to do sprints on the elliptical. Giving your body the workouts it needs are key! That is such a cool picture! Love it!